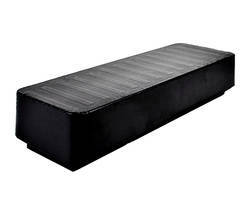 Capable of 5 lb continuous force, 5 lb Linear Stepper travels at 80 ips, can operate in any axis, and features 1 G acceleration. Two-phase, single-axis motor is capable of precise position, velocity, and acceleration control when integrated with microstepping drive and indexer; resolutions are .010 in. for full step and .00004 in. for one microstep. While suited for open loop positioning applications, unit can also be operated as brushless linear servo with 5 G acceleration. 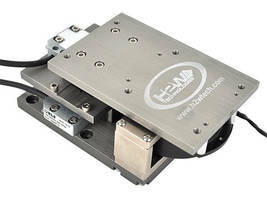 Valencia, CA - A low cost, high performance, 2-phase, linear stepper motor from H2W Technologies with 1 micron [0.00004 in.] resolution is designed for easy integration into new and existing applications. This, compact, industry standard, "5 lb. 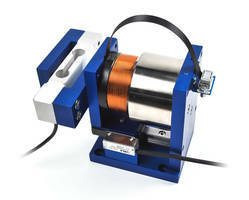 Linear Stepper" travels at 80 in/sec. [2 m/sec. ], can operate in any axis, and features 1 G acceleration. It is the ideal choice for: New and existing pick-and-place, wire bonder, parts transfer, fiber optic, semiconductor, and other precision robotic applications. The H2W Technologies, industry standard, "5 lb. 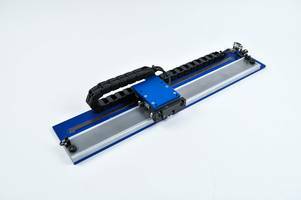 Linear Stepper" is capable of very precise position, velocity and acceleration control when integrated with a microstepping drive and indexer. 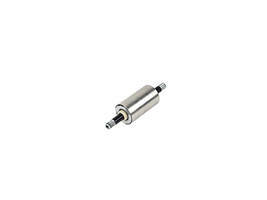 The resolution of this 2-phase motor is, one full step equals .010 in. [250 microns] and one microstep equals .00004 in. [1 micron]. 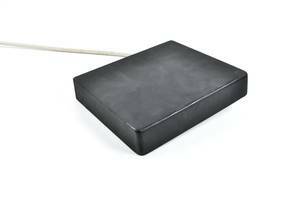 Ideal for open loop positioning applications with light payloads, the "5 lb. Linear Stepper" can also be operated as a brushless linear servo with 5Gs of acceleration and no loss of accuracy. Capable of 5 lbs. [22.2 N] of continuous force this single axis linear stepper has the forcer [motor], bearings and platen [track] integrated into a compact, low profile, package. The forcer connects to motion control system via flying leads or "D" connector. The hard chrome plated "Platen" [track] is available in lengths to 144 inches (3.7 m). For longer travel the platen can be supplied in sections, also, more than one forcer can operated on a platen at the same time. 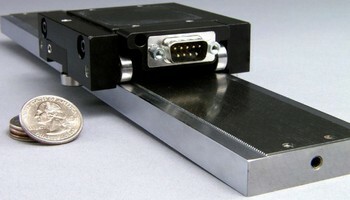 Linear steppers can also be custom designed to meet particular applications requirements. A complete packages including and indexer and driver for open loop operation or controller and driver for closed loop brushless servo motor operation are available from H2W Technologies.